Swedish Robins receive 32000 becquerel per kilogram. Shortly after the disastrous accident in the Chernobyl Nuclear Power Station on 26th April 1986, newspaper reports came in that large numbers of migrant birds died as a result of the released nuclear fallout. 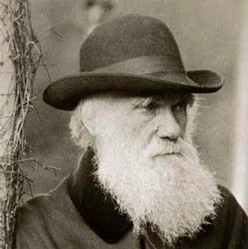 Though these deaths were never confirmed it was clear that the contamination of the environment was without precedent. At the same time reports trickled in about research on the amount of contamination in living organisms in particular in relation to human food such as sheep, cattle, reindeer and birds. Of course the accident provided a unique opportunity to study and monitor the effects of nuclear fallout of such enormous magnitude on the environment. Here at Voorne Bird Observatory we wondered if we could ,in any way ,add basic knowledge which could be used for future monitoring and evaluation. We decided that the migrant birds from Scandinavia which come our way each autumn could provide us with answers on the spread of fallout indirectly over Europe and Africa as well as the long term effects on the organisms involved. As members of the thrush family are practically always available in autumn we decided to focus on them and in particular on the Robin Erithacus rubecula . During favourable weather each autumn morning large numbers arrive in The Netherlands from Scandinavia. We collected robins in both the autumns of 1986 and 1987, in the latter we collected Blackbirds Turdus merula as well. Our first results were offered to and accepted for publication by the scientific journal Nature (see below). The editors of which had decided to publish a special publication on the Chernobyl disaster. Unfortunately, the idea was withdrawn and since then little has been published on the immediate effects of the Chernobyl accident. As we feel that it is important that what knowledge there is becomes public we have decided to open this website. We invite all who have results from similar studies to make them available to us so that we can publish them here. Also we welcome all literature references. Sir –Soon after the first reports of the Chernobyl fallout newspapers in The Netherlands published messages of high numbers of dead passerines migrant birds found in Scandinavia. Fortunately these turned out to be only based on rumours. But will the high amount of radionuclides precipitated in Scandinavia and Poland in April and May 1986 influence the bird population? In Robins Erythacusrubecula trapped in The Netherlands during September 1986 we found concentrations of radionuclides which were high enough to cause at least some serious concern. Between 11th September and 17th October 1986 we trapped 318 Robins at the Maasvlakte, an industrial area west of Rotterdam. We collected 13 Robins on 24, 25 and 26th September and stored them at – 20° before use. The birds showed no abnormal moult, had normal measurements and had normal weights (between 13 and 17 grams) thus they were apparently healthy. The 13 birds were not older than 5 months at date of capture. For the gamma- ray spectrometry the lungs, hearts, kidneys and breast muscles were removed and put in 10 ml of isotonic NaCI. This was sonified and freeze dried for 24 hours. After this the dry weight of this pooled sample was 9.23 gram. The freeze dried fraction was stored at -20° until use. Gamma ray spectrometry was performed on 2nd February 1987. Table 1 shows the results of activity measurements. 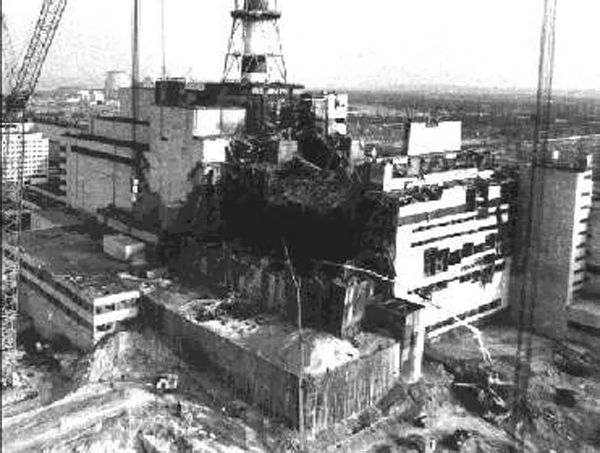 The ratio 134Cs/137Cs of 0.29 confirms (regarding the decay of 134Cs since 26 April 1987) that the activity found in the Robins was caused by Chernobyl fallout (1). It was surprising that fairly high amounts of both 95Zr and 95Nb could be detected 9 months after the accident. It means that much higher concentrations of these two short living nuclides must have been present in the birds at date of capture. High concentrations of these nuclides were only observed in the areas contaminated by fallout of the first plume (Scandinavia, Poland and the Baltic Soviet States) (2). Ringing data have shown that Robins trapped in The Netherlands during September and October originate from Scandinavia and Poland. It seems that the ringing data are confirmed by this radioactive research! 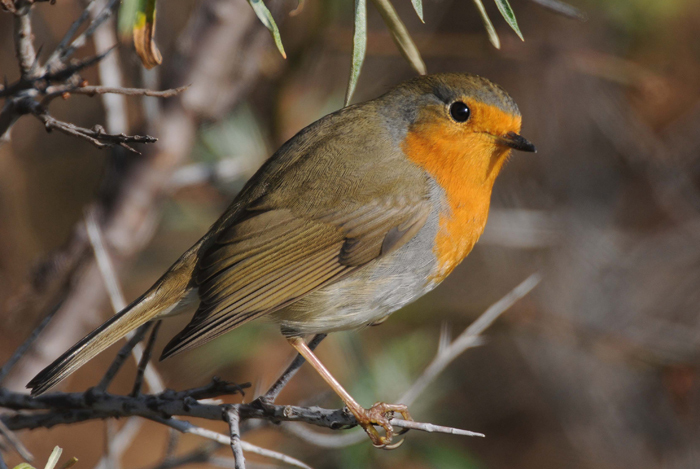 During the summer months Robins feed almost exclusively on insects and worms. Late summer they start to include berries in their diet. In order to keep in good condition they have to take between 7 and 10 grams of food every 24 hours containing at least 1.5 grams of proteins. The birds we have measured were all born in 1986, most likely in May or June. This means that they have lived 100 -120 days and must have consumed 700 – 1200 grams of insects and berries before they were collected. Assuming that contamination is only caused by the food they have consumed we can conclude that the activity found in the birds is in accordance with the estimates made for other samples from the same areas. At this moment it is not possible to predict the effect these high concentrations of radioactivity on the reproductivity of these birds. Perhaps that the 1987 breeding results will supply us this information. de Knijff, P. & N. D. van Swelm (Foundation Voorne Bird Observatory, The Netherlands) A. van der Wijk (Centre of Isotope Research, University of Groningen, The Netherlands). Please also see documentaries on the Chernobyl disaster.